Each product in this store includes a detailed warranty section. To view the warranty terms and conditions for a specific product please click on the "Warranty" tab as shown in the example below. We offer a 1 year, non-transferable warranty covering defects in materials and workmanship. 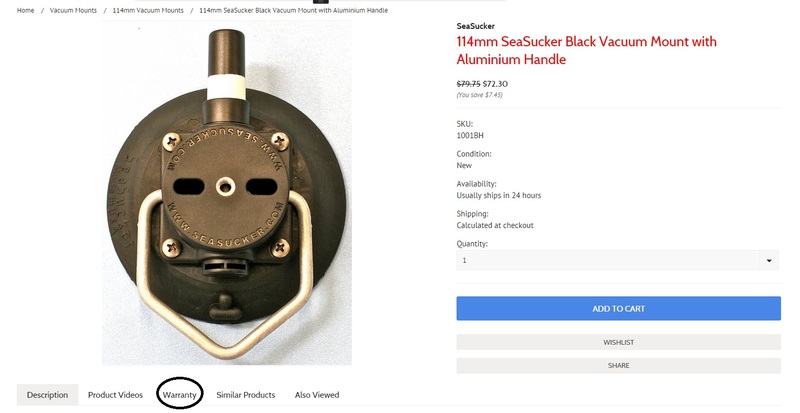 The warranty covers the defective product only and can be returned within 1 year of the date of original purchase to SeaSucker Down Under for replacement or repair. This shall constitute the sole remedy of the purchaser and the sole liability of SeaSucker Down Under Pty Ltd to the extent permitted by law. In no event shall SeaSucker Down Under Pty Ltd be liable for special or consequential damages. As of the 20th September 2016 SeaSucker Down Under now offers a 2 year warranty on all SeaSucker Bike Racks and Accessories. We chose to do this as a way of adding value to every SeaSucker Bike Rack and Accessory sold through us. Please be aware that the standard SeaSucker warranty remains at 12 months. The warranty extension is provided by SeaSucker Down Under for the sole benefit of its customers.